Yesterday I had to make a little trip to Waitrose to hunt down some medjool dates to make sugar-free mince pies for Christmas day. Yes, I am aware of how pathetic that opening sentence sounds, but hear me out for a second because it's Christmas, and we all do silly things at Christmas. Wandering through the over-crowded aisles, pushing through numerous disgruntled old folk saying "it's not normally like this", well no, it's four days before Christmas and we all need silly-season ingredients, like medjool dates. You know? This very short experience of an overcrowded shopping trip, full of unnecessary consumeristic acts made me further appreciate the environment that I call home. The county by the sea, Cornwall. 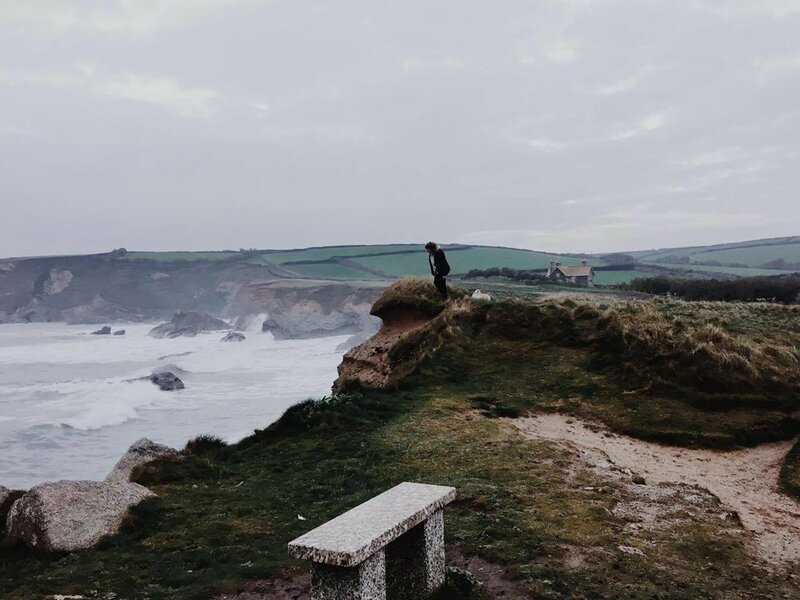 Despite it being on the other side of the world, or at least that's what it feels like when travelling to or from, Cornwall holds an almost tangible presence, often describe as magic by anyone who has experienced it. Cornwall is highly populated in summer months, which only enhances the calm of a wintery December on the coast. Completely serene and peaceful in comparison to the rest of the country. When I think of Cornwall in December, I think of beaches overcrowded with dogs and their owners, joyfully enjoying the crisp air before sharing hot chocolates to warm up. The die-hard cold water surfers still paddling out to catch the last few waves of the year. The odd local still in shorts and flip-flops. This life, on the other side of the world, has a 'be still' nature, a slow-living heartbeat that runs through anyone living in its sphere. Last Sunday, after a slow crafty afternoon making candles as christmas gifts, my friend and I decided a spontaneous camp trip was needed. We packed Mufasa-The-Landy with the weekend's left over fridge ingredients, the duvet off my bed and a few other insulated essentials and of course the oh-so-insta-worthy enamelware made for camp trips such as this. And off we went. 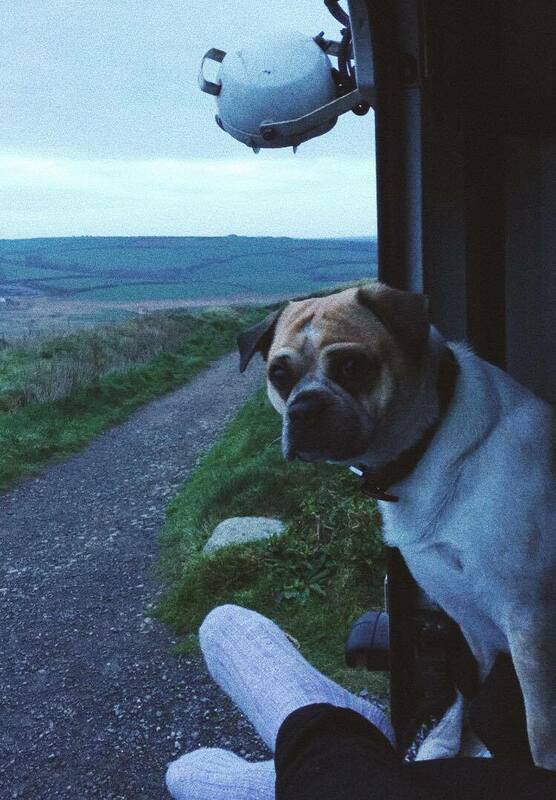 The sun had set, the dog was hyped up and we were making our way through the dark and winding cornish roads heading further south towards The Lizard in the hunt for a perfect cliff-side spot for the night. We parked up at Poldhu Cove, although the dark restricted us from seeing the edge of the cliff and that which went beyond it, we trusted our other senses that the sudden drop lead to sea waves and a perfect sunrise view for the morning. It was a cold 8 degrees celsius for most of the night so we didn't hesitate to set up the stove and start cooking up our dinner, which being a mixture of unplanned ingredients was surprisingly delicious. Chopped mushrooms, chickpeas, pakchoy, courgettes and sundried tomatoes cooked up in pesto accompanied by a little wholewheat pasta and feta. An easy option for camping that was still somewhat healthy and a great comfort in the cold! After we ate, the most obvious thing to do was drink, so we whacked some mulled wine on the stove and enjoyed the quiet of nature and the distant sound of crashing waves. The atmosphere was full of peace, friendship and conversations were had about grace, love and all the exciting adventures that the future holds. Possibilities that are created by our passions. Dwelling on thoughts of deep appreciation for all the good despite the bad. Slow living on nights such as this are the fuel that fire up my soul on the days so contrary to this, specifically the ones filled with grouchy people looking for medjool dates in an overcrowded shop a couple days before Christmas. If you relate to this, if you're far away from the 'be-still' nature of Cornwall or somewhere similar, if you're surrounded by the consequences of silly season, make the choice to meditate on the thoughts you know are good, the peace that defies the odds of Christmas stress and when you walk into a room of screaming children (or adults), be the one that shifts the atmosphere. "8-9 Summing it all up, friends, I’d say you’ll do best by filling your minds and meditating on things true, noble, reputable, authentic, compelling, gracious—the best, not the worst; the beautiful, not the ugly; things to praise, not things to curse. Put into practice what you learned from me, what you heard and saw and realized. Do that, and God, who makes everything work together, will work you into his most excellent harmonies." 2017. When Words Fail Me.